Laser marking machine is defined as a machine that is used to mark or emboss permanent alphanumerical details on the product. Laser marking machine mark the details in terms of brand name, batch number and other details. Laser marking machine is widely used in various industries for marking the component. Laser marking does not require inks or tool bits for marking the product. It is highly flexible marking process as compared to other marking process. The global laser marking machine market is expected to grow at a CAGR of 6.7% over the forecast period i.e. 2017-2024. Further, laser marking machine market is anticipated to reach noteworthy sales globally by 2024. Moreover, rising adoption of highly advanced marking technology by numerous industries such as automotive, aerospace and other industries for precise marking specifications on manufactured components are believed to bolster the growth of laser marking machine market across the globe. The global laser marking machine market is segmented into product type, end use application and region. On the basis end use application segment, the market is segmented into automotive, aerospace, machine tool, electronics & microelectronics, medical, packaging, military and others. Further, machine tool segment captured the largest laser marking machine market. Apart from this, fiber laser segment by product type seize the highest CAGR in the overall laser marking machine market by 2024. In terms of regional platform, Asia-Pacific is projected to dominate the global laser marking machine market over the forecast period. 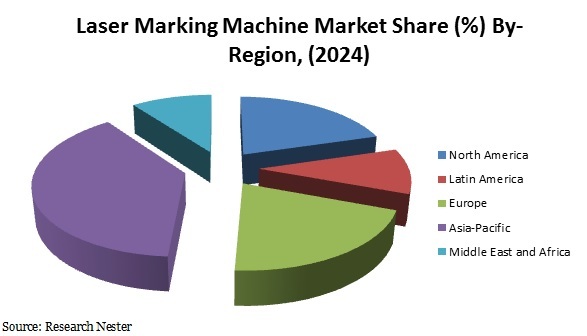 Additionally, Asia-Pacific region is believed to account for the highest market share of 38.4% in the global laser marking machine market by witnessing a CAGR of 8.6% during the forecast period. 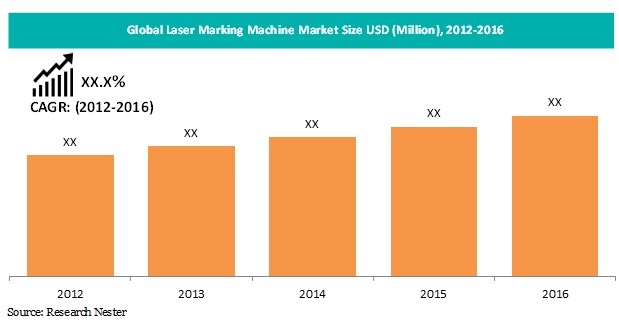 Moreover, the factors propelling the growth of laser marking machine market in this region includes growing demand for marking of components from automotive and packaging industry. Additionally, increasing penetration of big companies into Asia-Pacific due to cheap workforce is also anticipated to propel the growth of Asia-Pacific laser marking machine market. Implementation of numerous legislation by various agencies such as food and drug association (FDA) for marking of unique device identification for medical devices are anticipated to be the dynamic factor behind the rapid growth of laser marking machine market. Likely, wide spectrum of marking application in various industries along with introduction of highly efficient laser marking products such as fiber laser marking machine is predicted to foster the growth of laser marking machine market. Furthermore, technologically advancement in marking along with rising research and development activities by major players in the field of laser marking machine is also projected to flourish the growth of laser marking machine market. In addition to this, mounting demand for precise specifications on manufactured products is believed to bolster the growth of laser marking machine market by the end of 2024. Moreover, growing adoption of laser marking machine in various industries to provide permanent embossing solutions such as automobile, packaging and machine tools are some of the factors triggering the growth of laser marking machine market across the globe. On the contrary, lack of adoption of laser marking machine in underdeveloped region is expected to hinder the growth of laser marking machine market over the forecast period. ZHEJIANG JIATAI LASER SCIENCE&TECHNOLOGY CO., LTD.